MAC Viva Glam Rihanna Lipstick - A blue-red lipstick with a frost finish. I've got it in my head that this would look fabulous on us pale girls. I had the chance to pick it up today and I don't know what I waited for! I should have snatched it up before it's gone! Sonia Kashuk Body Butter in Purple Seductia - Have you smelled this in Target yet?! If not, drop everything and run to your nearest Target. This smells AMAZING. Target describes it as "effervescent pomegranate fuses with rose delicacy and earthy patchouli." I will literally buy anything patchouli scented - that's my jam. Sephora Triple Action Cleansing Water - What the heck?! A cleansing water here on American soil? Say it ain't so. And give it to me right this instant. Bobbi Brown Hydrating Eye Cream - As someone who suffers from dry under-eyes that are prone to dehydration lines, I want to give this a go. I've heard nothing but amazing things about this product. Dior Creme de Rose Lip Balm - This is one pricey lip balm, but apparently it's the eighth wonder of the world. I love all things rose scented, and I've got a feeling this lip balm and I would get along nicely. Thierry Mugler Alien Perfume - Why the @#$@# doesn't this come in a rollerball?! I've been lusting over this perfume for ages, but just can't part with the $120! My little Sephora samples will have to do the trick for now. Sonia Kashuk Chic Luminosity Glow Powder - This is brand new for Sonia Kashuk's Spring 2014 line and I haven't peeped it in stores quite yet. Could be a possible dupe for an Hourglass Ambient Lighting powder. Want want want! Nourish Organic Daily Exfoliating Body Polish - I don't know what it is about this product that has me intrigued, but I really want to try it out! I'm obsessed with the packaging - that's probably it. 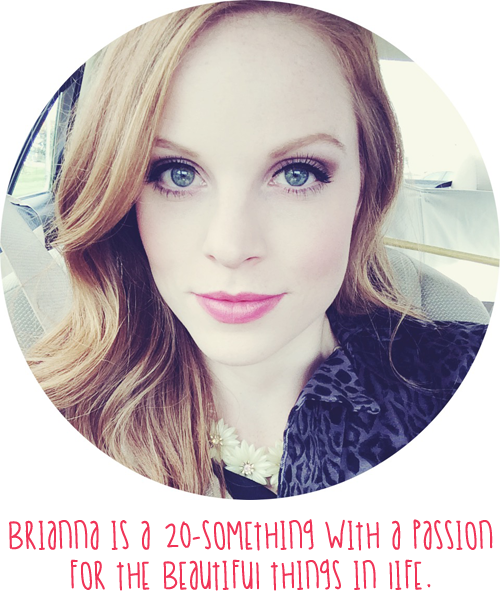 Bri, you're a doll and I am digging your blog. Thanks for leaving a comment on mine and I'm following your blog and social media. So you'll see me around. Please come join us for a new #MyLipstagram challenge on Instagram. We would love to have you! Aw thanks, Shalunya. I so enjoyed reading how you and your husband met on your blog! Looking forward to reading more great posts from you! I am obsessed with Lush and haven't seen this new limited edition one!! Thank you for bringing it to my attention - can't waaaaaaaait to get it!! The Rihanna lipstick sounds strange blue-red shade but I see what you mean about us pale gals. 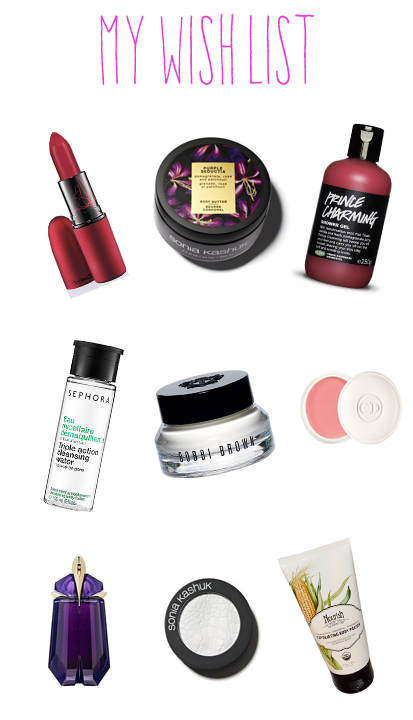 Great list, I've been wanting to try the Dior Lip Balm as well. It's all the rage, eh? The Dior Lip balm looks so lovely - it's definitely number 1 on my wish list!!! Couldn't agree more! :) Thanks for reading! I hadn't heard about the Sonia Kashuk glow powder, I'm excited for that one! I've also been eyeing the new Viva Glam releases, they're such a beautiful shade and I love the sparkle in the gloss. That Dior balm has been on my wishlist for ages! I think it's going to stay in my wishlist for ages, too because it's so pricey!